I have a collection of e-books and I am looking for a way to manage it from my operating system. What are the programs to manage e-books available for free? I use both Linux and Windows OS, can you suggest some good software? Calibre is a free and open source e-book library management application available. You can download from here which is available for all operating systems. Adobe Digital Editions is also one of the e-book manager by Adobe. You can access it from here. Alfa Ebooks Manager features a lot of templates and options for library vizualization. Besides, it allows to update book data from multiple web sources (like Amazon, Google Books, Barnes & Nobel, etc). It's also good at file management and metadata extraction. You can download it from here. Delicious Library's a bit different. Actually it's a software not just for books but for managing all stuff at your home. It's greates feature - entering books via webcam shot (it recognizes ISBN code). This feature makes Delicious Library the best software for collecting paper books. You can see the details from here. And if you are a mac user Delicious Library is the best e-book manager but unfortunately it's not free. Second priority I will give to Alfa eBooks Manager. Free and from Adobe. Be advised there has been some issues lately in viewing DRM .epub 3.0 ebooks and the fonts not rendering correctly. This is a bug that was introduced a few months ago on the update but no word yet on when the issue will be addressed. Download page for Adobe Digital Editions. You can install ADE on Ubuntu but you will need Wine. Good article read: "Howto install Adobe Digital Editions on Ubuntu 12.04 and use it with an e-book reader"
You mention ebooks but not what type. So just throwing Adobe PDF Reader for web .pdfs. Good write up over at AskUbuntu on installing adobe PDF reader on Ubuntu: "How do I install Adobe Acrobat Reader?" Jeboorker is also a look worth. I use it to manage my local epub and pdf ebooks. It's open source, and available for Linux and Windows. You can downlaod it here. Google Play Books is a good cloud option. They have iphone, android, and web. If you are looking for conversion functionality and more than just a library / reading, calibre as mentioned is useful. If you have Firefox browser, you can try EPUB Reader add-on. Simple clean interface, and good performance because it's using Firefox. user3228556 is a new contributor to this site. Take care in asking for clarification, commenting, and answering. Check out our Code of Conduct. Calibre, of course everyone will think of it. But if you tried you will find that Calibre is a little difficult use for those beginners especially when somebody want to remove drm. Calibre interface is complicated. Alternates, I will recommend you another tool, named Ultimate eBook Converter. A shareware but 30-days free trial. Not the answer you're looking for? Browse other questions tagged windows free linux mac-os ebook-management or ask your own question. Some classic literature is available for free - but where? How can I extract all the pictures from an ebook? 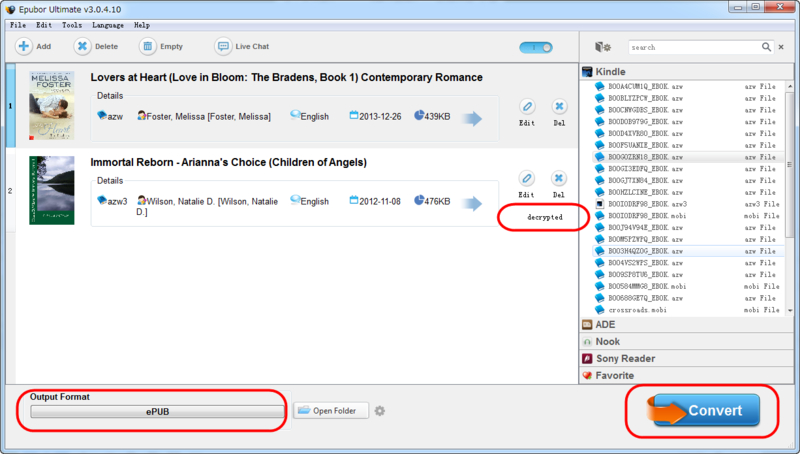 How to effectively manage ebooks using Calibre? Many sites propose free or cheap ebooks? Which are legitimate? Is there a way to share my Amazon eBook collection with other family members?